Next year’s Sri Lanka Cricket (SLC) Inter-Club Premier Cricket Tournament, the edition for 2013/14 might include a ‘Super Eights’ stage according to official sources. 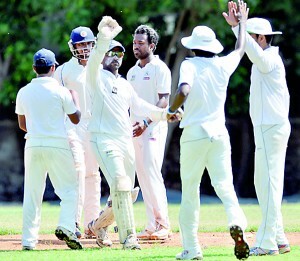 With the conclusion of the SLC Inter-Club Premier Cricket season for 2012/13 where Sinhalese Sports Club emerged champions, six teams are set to be demoted to the lower category which is likely to be named as the ‘emerging’ segment. “The top segment will be restricted to 14 teams as decided prior to the commencement of the concluded competition. The upcoming tournament in the top segment will have two groups, seven teams in each. We may have to introduce a ‘Super Eights’ stage as there will be six matches per team during the whole season,” Chandima Mapatuna the tournament manager of SLC told the Sunday Times. As agreed by the SLC officials and clubs last year, the three low-seed teams each from the two groups from this year’s Premier Tournament will be demoted to the emerging segment. A total of 14 teams, seven each from the two groups will remain in the Premier Tournament. The emerging segment will include a total of 10 teams with four teams to be added from the Sara Trophy segment according to agreed plans. By 2015 all segments of SLC will be confined to 10 teams each. Accordingly the six teams that face demotion from the Premier Tournament are Burgher Recreational Club (BRC), Lankan Cricket Club, Saracens, Navy Sports Club, Galle Cricket Club and Kurunegala Youth Cricket Club. BRC, Lankan and Saracens were placed among the latter three from the Group ‘A’ where Moors SC topped while from the champion SSC’s group Navy, Galle and Kurunegala YCC were seeded bottom. “If there will be a Super Eights stage, the winner of the tournament will be decided after a league competition. Nothing has been confirmed as yet. Things are still at discussion level,” Mapatuna added. The 2013/14 version of Premier Cricket Tournament is set to begin somewhere in December later this year. Champions SSC followed by Tamil Union, Nondescript CC, Sri Lanka Ports Authority, Colombo CC, Chilaw Marians and Badureliya SC survived in the main tournament from Group ‘A’ while this year’s runners-up Moors SC, Panadura SC, Army SC, Bloomfield, Colts, Ragama CC and Air Force SC remained from the Group ‘B’. The concluded three-day Premier Cricket Tournament was postponed on several occasions owing disagreement among some of the clubs and the conductors of the competition, the SLC. However after lengthy discussions and certain amendments to the promotion and demotion policies it was later decided to go ahead with the tournament with 20 teams in two separate groups. According to the proposal 20 teams played in a combined top tier segment which began in December 2012 as SLC officials recognised it as the only existing first class domestic competition. It was also decided then that after the end of the first year, six teams from the Premier segment will be demoted to an intended emerging segment, which will feature 10 teams with four teams coming to the top from the Sara segment. This segment too is intended to be played as a three-day tournament but will not be considered first class. SLC officials hope to confine 10 teams each in all segments by 2015 with the bottom seed of the Premier and top seed of the emerging segments playing a four-day relegation match. According to the proposal four teams, two from each group of the Premier tournament which will be conducted with the remaining 14 teams, will face relegation after the 2013/14 season. “The first round of matches of this competition will be played as day games and the second round matches will be played as day & night games together with the final to be played on May 20,” the SLC statement said.